Do you want to win a trolley full of groceries just by shopping here at the Plaza and answering your phone?! Well, now is your chance with The Great Grocery Grab! We’ve got some serious groceries to give away, and you could win it just by answering your phone! 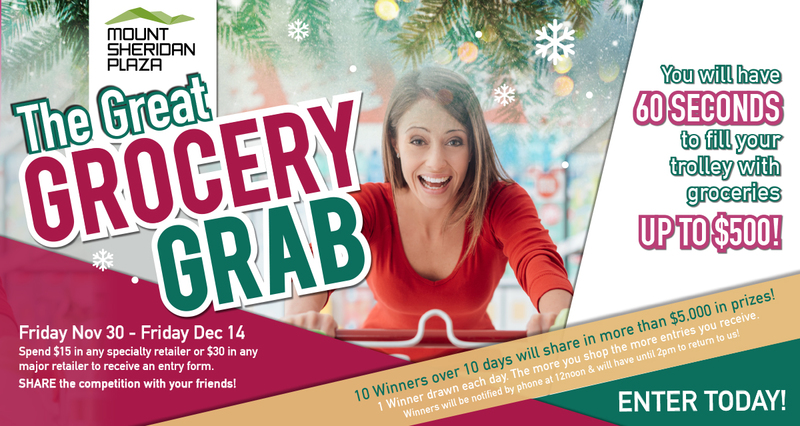 We’re giving you the chance to WIN $500 worth of groceries every day between Friday November 30 and Friday December 14 with the Mount Sheridan Plaza Grocery Grab! To enter, simply spend $15 or more in a single transaction, at a specialty retailer and or $30 in any major retailer and retain your original receipt, to receive an entry form. Then place your entry form in the entry boxes provided adjacent to Coles, Woolworths and Kmart for your chance to win! 1 winner will be announced each and every day over 2 weeks from Saturday December 1, so be sure to stay close to your phone between 12noon and 2pm cause if you miss the call and don’t return to us by 2pm, we will move onto the next winner and your right to claim the prize will be forfeited! Enter now and ask for an entry form when you shop here at the Plaza!